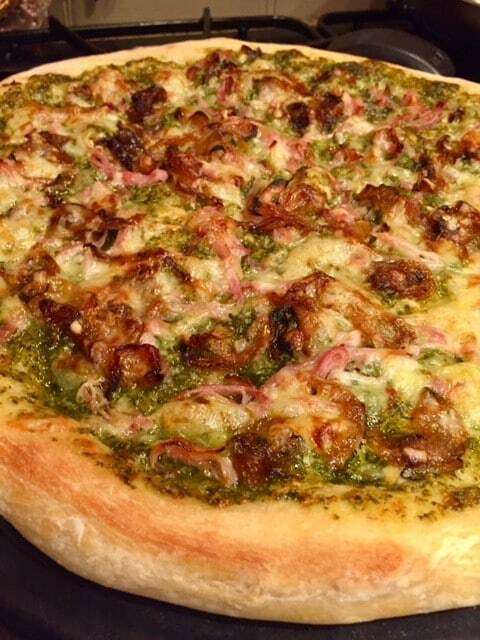 Pesto Pizza with rosemary ham & caramelized onions. 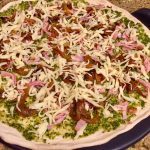 A few weeks ago I sent out a very basic pesto recipe which is wonderful on Pesto Pizza with rosemary ham & caramelized onions. I first made this as a thanks to a construction team at our home years ago. We had several options but this was the top choice 3 to 1. For those who like pesto – enjoy. 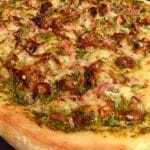 OK, pesto on a pizza isn't new, but add both caramelized onions and rosemary ham and you have a winner. At least a few years back when a construction crew at our house had their choice - hands down this one won. Preheat oven to 400°. Take pizza dough from fridge and let rise for 20 minutes as you prep. (Assuming you: prep onion, rosemary ham & grate the cheese. To caramelize the onion: heat a saute pan to medium high. Add your Olive Oil and the sliced or diced onion. Saute until soft and caramel in color. Set aside to cool. Lightly flour a work surface and your hands. Pick up your pizza dough and working in a continual circular motion - allow the dough to stretch to the size of a pizza stone, metal pizza pan or rectangle sheet pan. Note: Alton Brown has a pretty funny u-tube on this! Yes, you can toss it and catch it on your fists and all! Make sure you leave a little ridge along the edge as your crust. Dust your pizza stone or pan with a bit of flour and start your topping process. 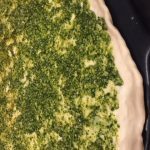 Top the dough with pesto and spread evenly. Add in order of preference: Layer of mozzarella, sliced thin strips of rosemary ham, caramelized onion. Bake for 15-18 minutes or until the crust is golden brown. Enjoy.